People poured out blessings upon us both. their words filled my ears. I heard it all, and it settled in the warm spot between my heart and my stomach. Words – my love language – find me again today and rain down in my mind. The moment rises once again, catches in my throat on the way up. And warmth floods my whole being. To be who you be. To love who you be. To share who you be. But I am no wiser. No more perfect and polished. If anything, I am more broken. My heart, my soul filled with love and cracked wide open. And I’m not quite ready to put it all back together. 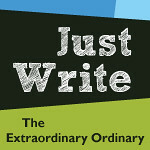 Heather of the EO invited us to Just Write with her. Don’t you want to join us?